At the July 21 “Paper Towns” New York premiere at AMC Loews Lincoln Square, Halston Sage and Cara Delevingne set the Red Carpet on fire with their glammed up looks. Halston choose to wear head-to-toe Miu Miu with jewelry by Melinda Maria and Melissa Kaye, while Cara sparkled in a Saint Laurent long-sleeved cutout mini dress. For Halston Sage’s look, it was none other than Celebrity hair guru and bohemian braid brainchild, Sarah Potempa who got Halston's hair Red Carpet Ready. Sarah created a chic, center part and loose waves that we can all nail at home. Step 3: Take large 3" sections (starting at the bottom) and secure the rest of the hair up with a SARAHPOTEMPA Darby Clip. Hold the SARAHPOTEMPA Beachwaver S1 horizontal, clamp ends of hair and automatically rotate under by pressing the arrow button down. Brush out and secure up in rolls with silver clips. L’Oréal Paris Celebrity Hairstylist, Mara Roszak worked with Cara Delevingne in prep for the evening’s NYC Paper Towns premiere. “The style was all about effortless, barely there waves, but with an edge. There was a detailed element to the look that still had a casual vibe to it – a fresh take on a braid. Cara’s gown and makeup were so glamorous, so the hair gave it that cool-girl finish,” shared Mara. L’Oréal Paris – Online at L’Oréal and retail outlets nationwide. Cara Delevingne was the face of Yves Saint Laurent's BabyDoll mascara in 2013, but now, the 21-year-old model joins the ranks of Claudia Schiffer and Jessica Chastain to become the brand’s face for its Spring 2014 campaign. Spotted just days ago on the beaches of Barbados with close friend Rihanna, Cara was makeup free and island chill, but the new YSL campaign shows the model polished and completely glamorous. As for the Yves Saint Laurent Beauté Spring 2014 line, it is as beautiful as Cara. 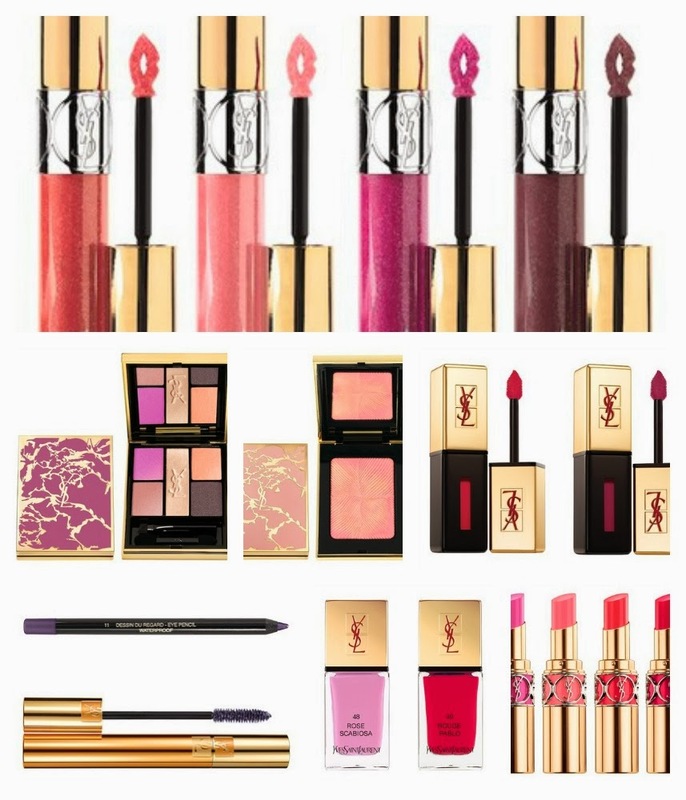 The YSL Spring 2014 makeup collection drew inspiration from a bouquet of roses, peonies and irises. The collection indulges in a palette of floral tones featuring fresh new cosmetics, including some limited editions as well as new colors for some of the brand's iconic products. The line definitely balances the innocent, sweet beauty of spring with a kick of sensuality. The new collection will be available February 17 at select retailers with notification available at Yves Saint Laurent. Burberry announced today, March 1, that fashion’s new “It” girl, Cara Delevingne is the face for the Burberry Body Collection campaign and introduced an additional scent to the Body Collection. The campaign was photographed by Mario Testino and pays homage to Burberry’s hometown roots, as the photo shoot took place along the River Thames. Christopher Bailey, Burberry’s CCO, explained his choice of location “Cara’s natural beauty and vibrant energy lit up alongside London’s magnificent architecture.” Check out exclusive behind-the-scenes photos from the shoot and the Burberry Body Tender ad video featuring Cara! Cara Delevingne’s face dominated Fashion Week and Cara was recently featured in GlossyBox Magazine’s February edition as THE style icon of the UK. Cara began her relationship with Burberry in 2011 and has been the face of Burberry Cosmetics since 2012, with the Burberry Body Tender being Cara’s first perfume campaign. Burberry Body Tender is available exclusively at Burberry and will be available in U.S. department stores May 2013.